As I write this letter to you, many of us throughout the U.S. and around the world will be celebrating St. Valentine’s Day. Close friends and loved ones send cards and flowers to one another — expressing love or deep friendship. School children may even exchange “Valentines.” Cartoonist Charles Schulz portrayed such an exchange in his comic strip, “Peanuts.” In one scenario when Charlie Brown gives a Valentine to a little red-haired girl, he feels the heartache that most of us have felt at one time or another and realizes that love given is not always love returned. The quote at the top of this page reminds us that while love is something many of us may long for, there are some things that are even more vital to life. One of them is water. Some of the school children in Bagamoyo. 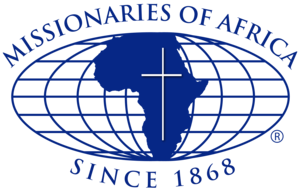 Recently, I received a letter from Sr. Mary Joseph Kanyua — a missionary working in the Bagamoyo District in the coastal region of Tanzania in East Africa. There, Sr. Mary Joseph is in charge of Holy Family School. The Sisters built a school for poor families living in the community — since there were no educational opportunities for the children. Women fetching water from a shallow well. A child giving water to livestock. As I read Sr. Mary Joseph’s letter, I could not help but think how often we take some of life’s basic necessities — such as clean water — for granted. As poet W. H. Auden reminds us, it is something we truly cannot live without. I am also hoping that you will join me in taking just a few steps to conserve the water that we have. For example, repairing or replacing a leaky faucet, as well as taking shorter showers (instead of filling an entire bathtub), are just a couple of ways we can help conserve one of our greatest resources. I am also hoping that you will send a donation to help the children at Sr. Mary Joseph’s mission in Bagamoyo, Tanzania, get the clean water they desperately need. While our goal is to raise at least $28,000 for this project — and other water projects of the Missionaries of Africa throughout East Africa, please know that whatever amount you send will help keep our missionaries working with those most in need. For this, I cannot thank you enough.